There are two kinds of people in the pet world. There are those who think of pets as commodities, property, “just animals.” Then there are those who recognize what science is only just beginning to understand, that dogs are intelligent creatures who have the capacity to understand human language and are capable of a broad range of emotions. Most people used to fall into the first category. But, just as most people long ago invited their dogs into their homes rather than making them live in backyard dog houses, most people today consider their dog to be part of their family. This change in attitudes is wonderful for dogs, and it created a strong business opportunity for Camp Bow Wow. Our country’s pet ownership culture has changed, but until Camp Bow Wow came along, the services offered to pet parents reflected the mindset of yesteryear. When founder Heidi Ganahl was looking for a place to keep her own dogs in the early 2000s, she realized she’d finally had it with the outdated kennel model. Dogs were usually kept in chain-link cages, let out to exercise in no-frills dog runs, and then put back in the cage. They were treated like, well, animals. But with Camp Bow Wow, Heidi envisioned a place that dogs would have designed for themselves. That’s why, at Camp Bow Wow, dogs get to do what dogs love best when they’re not hanging with their human families: run and romp with their canine pals. And unlike the kind of unsupervised, big-dog-take-all situation you might find at, say, a dog park, Camp Bow Wow dogs are tended to by trained supervisors whose passion for dogs is equal to that of our franchise owners. 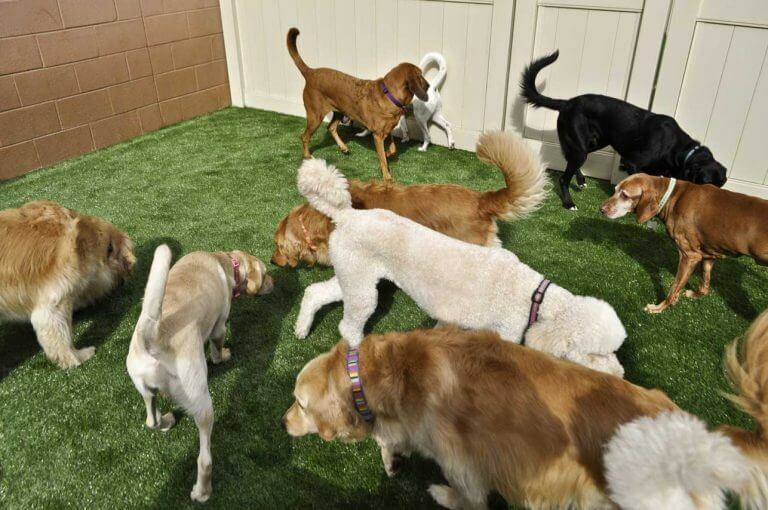 Dogs have indoor-outdoor play yards, and they’re separated into groups based on size and energy level. While there are many mom-and-pop doggy day cares these days, we were the original disruptor of the traditional boarding model, in the same way that Apple once upset the personal computer market and Starbucks innovated the coffee-on-the-go business. We continue to innovate to stay one step ahead of the pet care industry. When VCA became our parent company in 2014, we added a whole new layer of expertise to our brand. VCA, a $5+ billion market cap public company and the largest veterinary animal hospital network in North America, provides the springboard that is taking our franchise owners and our brand to the next level. With its network of 700+ animal hospitals in the U.S. and Canada, VCA has empowered Camp Bow Wow to deepen our knowledge base and raise the bar even higher on the standards of canine care. Camp Bow Wow has several service lines — including boarding, doggy day care, grooming, training, in-home pet care and retail — allowing franchise owners multiple ways to earn revenue, and we have some exciting things coming in 2016 as we experiment with new ways to serve a growing demographic of dog-obsessed humans. And as that demographic grows, so does our brand. We have over 130 franchises nationwide and an ambitious plan for growth. If you’re a business-savvy executive or an entrepreneur who’s as passionate about pooches as we are, this could be the right opportunity for you. To find out more about becoming a Camp Bow Wow franchisee, please explore our research pages or fill out the form at right to download our free franchise report and start a conversation. *Figure represents the aggregate increase in annual gross revenue for the 131 franchises that were open and operating for any length of time during the 12-month period ending on December 31, 2015 when compared to the aggregate annual gross revenue for the 130 franchises that were open and operating for any length of time during the 12-month period ending on December 31, 2014. The financial performance representation contained in Item 19 of our 2016 Franchise Disclosure Document also includes: (1) annual unit-level gross revenue; (2) annual average gross ticket and, (3) selected expenses for expense-reporting franchises. ** Figure represents the system-wide consolidated, unaudited gross revenue for the 131 franchises and 7 corporate locations that were open and operating for any length of time during the 12-month period ending on December 31, 2016. The financial performance representation contained in Item 19 of our 2016 Franchise Disclosure Document also includes: (1) annual unit-level gross revenue; (2) annual average gross ticket and, (3) selected expenses for expense-reporting franchises.